Now on to the real topic at hand: after a long Saturday of traveling and a night literally sleeping in the hayloft, Sunday is when the fun and hard work really began, the day when the students arrived. In the morning we woke shortly after sunrise and shook off the ‘fruit punch ice cream float’ concoction that we used as a conversation lubricant the night before. Not skipping a beat, our Romanian hosts had a breakfast table loaded with tomatoes, cucumbers, muesli, cheese, cured meats and endlessly flowing coffee. Following breakfast, the coordinators and volunteers got together to review the day’s activities (really more of a creation session than review) and then we broke off to make sure everything was ready for the day. Since there had been rain the night before I volunteered to make sure the tents were dry and ready for the luggage and sleeping bags currently in route. Perhaps making for more adventure than some campers were up for, the tents were not particularly waterproof, and the forecast was thoroughly dotted with rain clouds. After working up a solid sweat, and probably adding more liquid to the tents then I actually sopped up it, was time to form a receiving line and meet my first ever group of campers. Since our campers didn’t arrive until after 1pm in the afternoon the day was totally geared towards everyone getting to know each other and the activities clearly reflected this goal. After a few quick introductions by the staff and volunteers, and after the parents got comfortable with the camp setting and said their goodbyes we kicked things off with a version of “Speed Dating.” Everyone in the group had to quickly move through the crowd and introduce themselves to as many other people as they could, given the allotted time. To make this activity a little more fun, the campers were given a brief script and encouraged to use a formal British accent. Giggles and laughter let on that the activity was working well as an icebreaker. Next we used an idea that I stole and adapted from Pre-Service Training, where all of our campers formed a large circle and, in order, listed their name and an adjective that more or less identified with their personality and that also began with the same letter as their first name. The catch is that the next person in line has to not only say their own name and adjective but also that of everyone that has gone before them. This ensures that at least those students toward the end of the circle are paying extra close attention. Knowing that whomever went last had a real challenge on their hands I naturally went first, and not surprisingly I broke the rules right off the bat and said “Jeremy the Java Man” which is more of a noun than an adjective (you try coming up with an adjective on the fly that starts with ‘J’ and describes me). Java Man did seem appropriate though considering my love of coffee, besides the campers got a kick out of it. Some other examples were: Aran the Abominable, Adrian the Atomic, Nico the Nice, Tudor the Traveler, Tudor the Tiny (surprisingly endearing, this name stuck all week, as he was the smallest in our group), Nick the Normal, Alex the Abnormal and so on. What’s great about this activity is that everyone in the group is required to speak up, so as an organizer you are able to quickly identify those with in the group that are perhaps shy or relatively weak in English. The activity also begins to build a support structure among the campers because inevitably they help each other through the long list toward the end. The downside is perhaps that it can get a little boring for those that went at the beginning as they wait for the long list to be repeated over and over; however it works at the start of a camp because everyone is still on their best behavior. Next on the agenda was allotted time for the campers to settle into their tents and then to reconvene for lunch, the first of many great meals. In an effort to build a team mentality right from the beginning we divided the group of twenty-seven into four groups with tents closely placed. Here I suggested another idea that I stole from Peace Corps, this time from our staging event in Philadelphia. All of the campers were placed in a large circle, oldest to youngest, (slight deviation from the original game) each camper facing outwards so they couldn’t directly see other members of the group. We then placed sticky paper dots of four varying colors on each person’s back in an alternating manner. Alternating the dots helped to ensure that each group had a broad range of ages since our group was fourteen to eighteen and we wanted to promote cooperation across age groups. Not knowing what color dot is on their own back, we gave instructions for them to figure out what they should do next, with the main rule being that they are not allowed to talk; this is were it gets interesting and the antics begin. Slowly they started to figure out what was going on and they formed into groups of like colors. This was the beginning of the individual group dynamic that, as coordinators, we’d feed off and plan all future activities around. After lunch it was time for more team building games, activities and for the students to create their individual ‘tribes.’ Kicking the afternoon off with some physical activity we played a game, new to me, called “TuTuTuTu.” The field of players was split into two equal groups, spread away from each other and divided down the middle with a row of blue scarves. One member of one of the teams is designated by the referee to start things off. That player then has to take a deep breath, run across the blue line and touch as many people on the other side while saying “Tu Tu Tu Tu….” and without taking in another breath until they cross back to their own side. Everyone that has been touched has to go with the player to the other side at the end of the round. During the subsequent rounds anyone who wants to cross the line can, provided they follow the above rules. One catch is that a player can grab and hold onto an invading player until they run out of breath, if this happens the invader has to stay on the opponents side and is then converted to that team. The game ends when all players are on one side. In keeping with the pace, the next game we played was called “Trophy.” Again the group is split down the middle and separated on two sides. 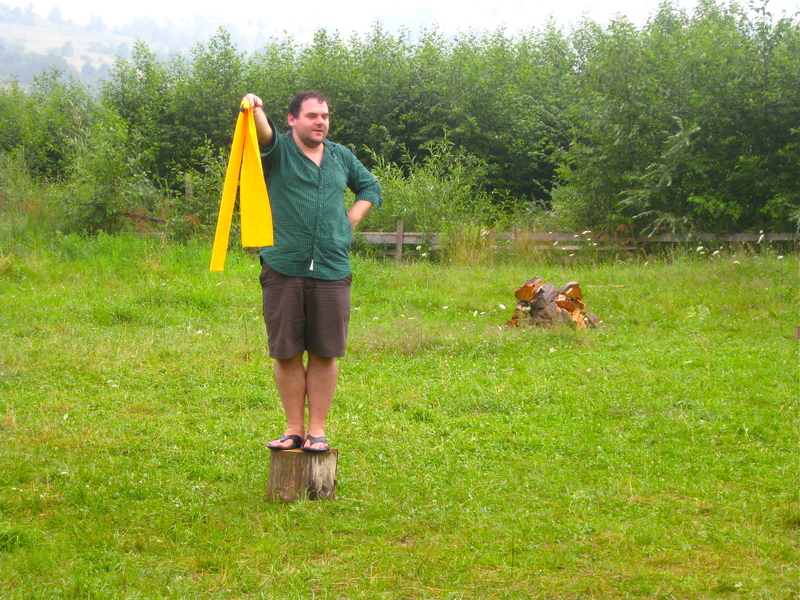 This time, a facilitator stands on a stump in the middle holding a yellow scarf. Each of the two teams numbered off from 1 through 13 (we were still short one camper at this point so we had an even number). When the facilitator called out number, one of three things could happen. If a single number is called, then each player with that number runs out and tries to grab the scarf and run it back to his line with out the other player stopping him. Once the scarf is in hand, if touched by your opponent, they score the point. If two numbers are called, then those two players from each team have grab the scarf together while running arms locked back to back. 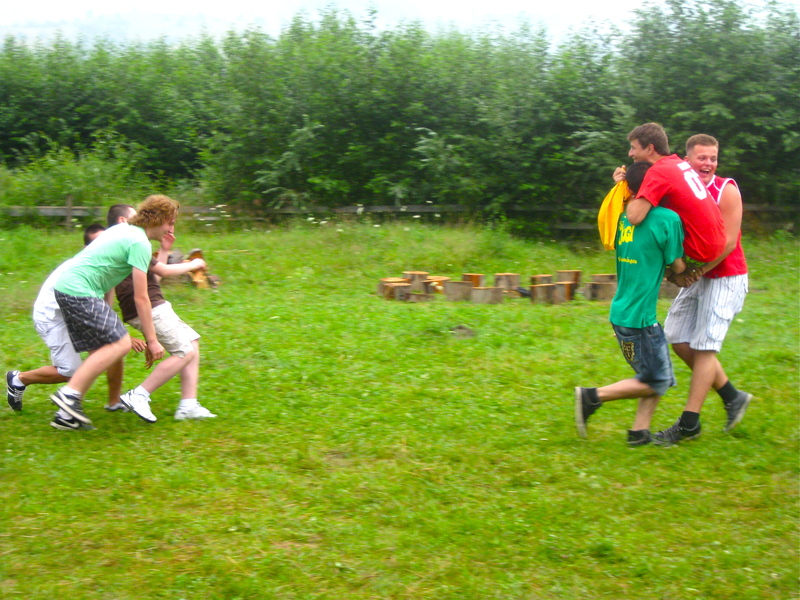 When three numbers were called, the corresponding players had to create a human chair and carry the third player to and from the facilitator holding the scarf. A fourth option exists in which four numbers are called and three of the players have to carry the fourth in an ‘airplane’ configuration, one player on each arm and one at the feet. Sighting obvious injury risk on this last option with unavoidable face plants into the ground, we opted to skip it. After everyone worked up a sweat and worked off the anxiety of being in a new camp with new people, we brought everyone back into the main tent for another sit down activity, Truth and Lies, another one that I stole, this time from a TEFL website. Perhaps obviously, in this activity each participant has to come up with two things true about themselves and one lie. After a few minutes of private brainstorming, we proceeded to go around the group circle, one by one. As an example, I offered: 1. I have been to culinary school, 2. I have been to Australia, and 3. I used to race motorcycles in San Diego. This exercise provided a great opportunity to get to know a couple interesting things about each camper and it offered a glimpse into their individual senses of humor. Next the teams, until now been called by their color, was given the opportunity to break off and develop their tribal identities. Each group was instructed to come up with a Tribe Name, Slogan/Chant, Stomp, Handshake, and Flag etc. After providing them with plenty of time and materials to get creative we broke for dinner, setting the expectation that each group would have to present their results after the meal. In no particular order the results were as follows: The Tenters, The Pheonix (yes, misspelling noted and apparently intentional), The Redds (a Romanian beer, but apparently only coincidental) and The Zoo-Loo. 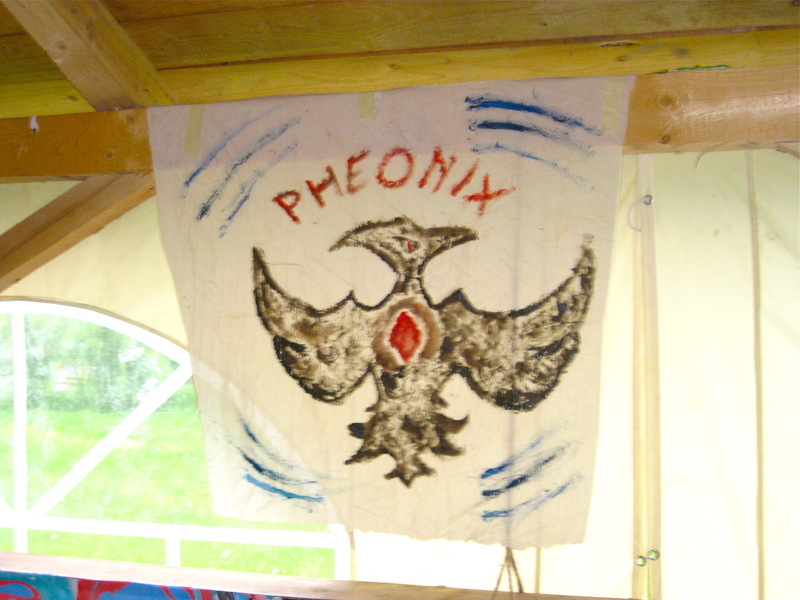 Perhaps the most memorable was the performance by The Pheonix group. Their ‘stomp’ consisted of two guitar players strumming along to an unrecognizable tune and two other members dancing around the center of the circle, slowly flapping their arms until they collapsed to the ground (reportedly turning into ashes), and then they rose again. This was absolutely priceless as the entire group irrupted into laughter; good memories were definitely starting to form. Even before starting the ‘stomp’ one team member of the group said, “Don’t forget to take pictures, because this will be a golden moment.” Luckily, I got video. After creating and introducing their tribes it was time for the daily debrief. One camp counselor brought an ‘African rain stick’ that we used to pass around the group as a stand in for a talking stick. The idea was that as we passed the stick around, only the person holding it (or touching it) could speak. We encouraged everyone to say a few words but it was not required. This is where the group really blew me away and a precedent was sent for the remainder of the week. Throughout the course of the day, the campers had already started to thoroughly impress me with their English speaking ability, but now we were getting into deeper, unprovoked monologs. Almost every camper provided thoughtful and valuable feedback regarding his impressions of the first day. Many addressed their earlier concerns over attending such a camp, indicating they more or less had to be dragged to the event and then how they realized how happy they were to be there. Others spoke at length about what which activities they liked the most and specifically why. My comments focused on how impressed I was with their language ability and how much I was looking forward to working with them throughout the week. We closed out the first day of sessions by introducing a new game that was to continually take place, behind the scenes, over the next few days called “The Tea-Bag Killer.” Everyone participated, volunteers, coordinators and campers alike. We each drew a card from a bowl, on which a specific role was written or nothing at all. One person secretly received a card saying “Killer,” two others received a card saying “Copy Cat” and the remainder received blank cards implying potential “Victim”. The objective was for the Killer to knock everyone off without revealing his identify. He could only do this by showing the tea-bag to a person in private, no group killing in other words. 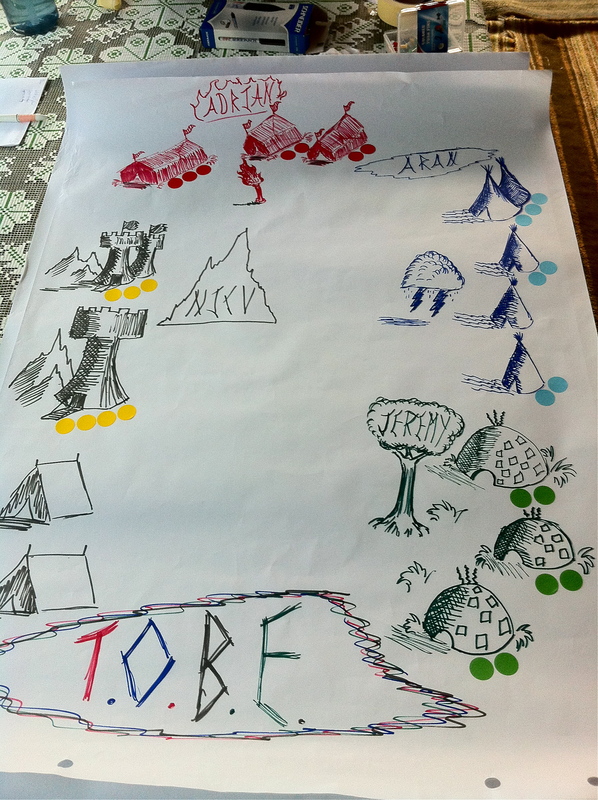 Once dead, a player would write his name on a publicly placed sheet of flow chart paper. The Killer could then elicit the assistance of Victims by isolating those still alive. The Killer could knock someone off that wasn’t “alone” only if they were with “dead” people. To make things more interesting, there were two Copy Cats. If the Killer unknowingly presents the tea-bag to a Copy Cat player, the Killer himself dies and the Copy Cat then becomes the new Killer. That wrapped up the first full day with the Campers, well almost. One tent was designated for a counselor or two (the only completely water-proof one thankfully) with the idea being that one of us would be easily accessible in the event troubles were to brew. Although fundamentally a very important aspect to any camp, the downside was that one of us would actually have to sleep out their with the kids. Wanting to get this over with on the first night (and as it happens, second night), I volunteered for the first shift. Imagine twenty-seven (our final participant arrived shortly after eleven p.m.) teenage boys; with naturally uncontrollably loud voices, three guitars and an abundance of energy. Now imagine that in a field, with paper thin tents, placed closely together at two a.m. Ironically, my saving grace was a torrential down pour of rain that began around three a.m. and drowned out all of the background noise. Initially, I was perturbed at the whole scenario, but slowly I realized that this was to be a unique moment in their lives and that they should be allowed to enjoy, so I refrained from interjecting. Plus, I secretly plotted my revenge, which was to include a bullhorn at close proximity the next morning at seven a.m. So jealous of all those camp games! Seriously, I love games like that. You should try and play a few at your school, too.